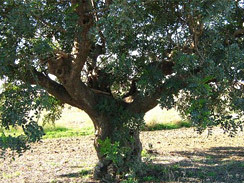 Carob trees grow up to 30′ tall. The tree is broad and semi-spherical, supported by a thick trunk with brown rough bark. Leaves grow in long alternate pinnate clusters. The fruit is an elongated pod that can grow straight or curved. Pods take a full year to develop and ripen, so can often be seen bright green in the trees. Ripe pods turn warm dark brown and eventually fall to the ground. Carob trees are native to the Mediterranean but have become naturalized almost-natives here in Southern California.Carob pods are an excellent food source and are one of the oldest forms of sugar used by humans. Typically the pods are dried or roasted, then pulverized into a mildly sweet powder reminiscent of chocolate. In powdered, chip, or syrup form it is used as an ingredient in cakes and cookies, and as a chocolate substitute. 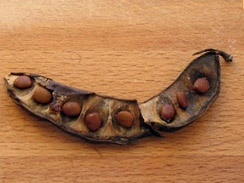 The extremely hard seeds are separated from the pods for use as a food thickening agent.Pods are best harvested when they turn fully brown but are still plump and firm. Waiting too long in the season results in overly-dry pods with a smaller, less sweet yield. Harvest 2-5 pound of pods. Remove all leaves and stems, wash in cold water. Soak in cold water for 12-48 hours, to soften pods. Only after soaking, slice pods open using a butter knife and remove all seeds. (Keep seeds separate for use as an emulsifier.) Break pods into small pieces no longer than 1″ each. Layer onto cookie sheets, then transfer to heat source for drying. Pods are usually ready to harvest in high summer here in So Cal, so timing is perfect to dry the pods out in the sun on very hot days. I place the cookie sheets on my car hood in full sun where they soak up intense heat for one or two days. If that’s not possible due to weather, you can use a food dehydrator, or set your oven to the lowest temperature, and dry overnight. 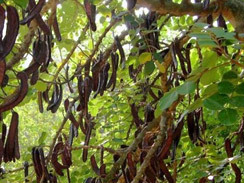 Carob loses flavor when exposed to high heat, so be mindful of of using the lowest practical temperature for drying. 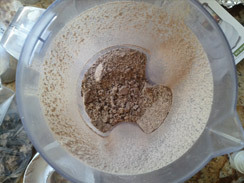 When broken pods are completely dry, transfer 1 cup at a time into blender, and pulverize on highest setting until reduced to powder. Transfer to air-tight jars for storage. Cut fruit into chunks. 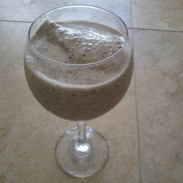 Process all ingredients in blender on highest setting until ice is crushed and ingredients are blended smoothly. Pour in a large bulb shaped glass, sit back, and enjoy your breakfast. tastes amazingingly refreshing on hot summer days, won’t wieght you down.